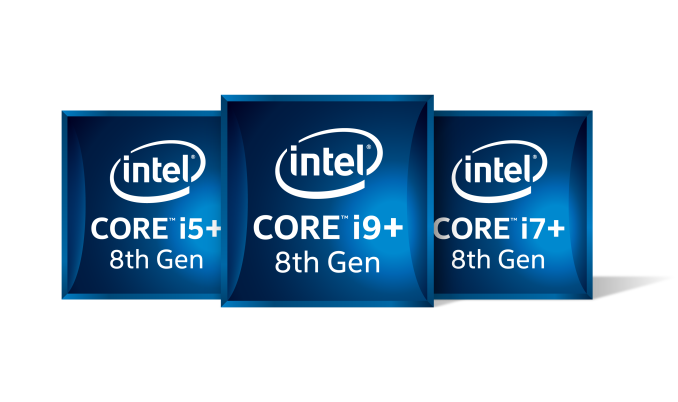 During the mêlée of last week and Intel announcing the next wave of 8th Gen Core processors, there were a few products that Intel did not include in the official announcement. The ones that we caught were the Pentium Gold and Celeron desktop product line, but over the weekend we have also noticed that Intel is introducing a new line of ‘B’ processors. The key features of the B processors are that they are named and perform similarly to the desktop processors the names are based on, but are not designed for socketed desktops: they use BGA mounting, similar to notebook processors. The high-end notebook processors, Core-H, are historically denoted by their 45W TDP, while these new Core-B processors have a 65W TDP. Intel has stated that this is not a ‘new B-series’ of processors, however they do not fall into the standard Core-S desktop definition, nor do they really qualify as notebook processors, siting above the Core-H line in a high-power segment that Intel defines for All-in-One types of systems (monitor with the PC embedded in the back). The goal of the Core-B line, as we were told, is to offer embedded versions of desktop processors for AIO-type form factors with a lower z-height, enabling a more streamlined and premium design for integrated desktops. In the past this segment was supplied by Core-H or socketed Core-S processors. It is a little strange though – Intel’s own processor model tracking system, ARK, has a field for ‘embedded options available’ with the desktop processors, suggesting that they could have just said ‘yes’ and kept the name the same. But on a positive side, we can now identify which AIOs are using socketed parts compared to those using embedded parts, identified by the Core-B CPUs. The initial run of the Core-B line will have a Core i7-8700B, Core i5-8500B, and Core i5-8400B. In all respects, these are identical to their 65W desktop equivalents. That includes core counts, base frequencies, turbo frequencies, memory support, Optane support, and integrated graphics. The only difference however is that these CPUs are likely to be placed into TDP-limited scenarios enabled through firmware. For example, take the MSI Vortex G25 system. I saw this at the end of last year at an Intel event in London, and noticed it had the Core i7-8700 processor in it. Based on our initial 8th Generation review and internal testing, I knew that the Core i7-8700 in a thermally unrestricted desktop drew a lot of power depending on how the BIOS was configured – somewhere north of 120W when the system was loaded and Intel’s all-core turbo was in play. So in spending 10 minutes with the Vortex system, I was able to determine that the Core i7-8700 in it was limited at the BIOS level to 65W maximum. As a result, for anything approaching serious multi-core workloads, the system was running at 3.2 GHz. This ultimately made sense – the system design, with a big GPU inside, is limited by the ability to remove heat. The system was also designed by MSI’s laptop team, so they do know a thing or two about adjusting TDP limits using the BIOS. However, we were now in a situation where the Core i7-8700 in the MSI Vortex would perform significantly worse (up to 33%) on certain workloads due to the TDP limitation compared to a thermally unrestricted Core i7-8700 in a desktop allowed to implement the standard turbo profile. The net result here is that systems like the Vortex will transition to these new Core-B processors. The upside is that the system design could be more efficient, and that when we see a B-series processor, we could ascertain that the turbo performance (especially multi-core turbo) might be lower than the desktop equivalent. The downside is the user will not be getting unrestricted i7-8700 performance. Also on Intel’s cards, but not in the official announcements, was the CM246 mobile chipset, used by the new 8th Gen Core laptops that have Xeon-E processors in them. This chipset is a beefed up version of the HM370 chipset, supporting 24 PCIe lanes, six USB 3.1 (10 Gbps) ports, eight SATA ports, vPro, and Intel’s RST Enterprise. Intel rates the chipset at a 3W TDP. We are still waiting for the full announcement of the Xeon-E line, however. 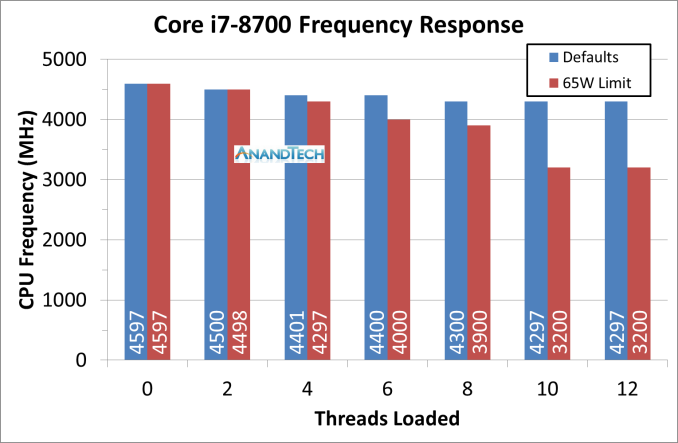 The jump from 8 to 12 threads isn't likely to be as important as the move from 4 to 6 real cores. It's a silly term that caught on because it sounds weird and makes a person question what it means... A symptom of the clickbaity 'curiosity gap' abusing culture we live in today.